"Ned Christie's story is one of tragedy. He was a suspect in the killing of a lawman. It was shown later that he did not do the killing. Still, as a suspect, the lawmen entered the indian territory in pursuit of Ned Christie, but neighbors announced any approaching posse. Each time Ned was prepared and his marksman skills held them off. The pursuers usually left with a number of wounded. He is the only man in history that it took several years for the U.S. Government to get who stayed at his own home the whole time. Ned was an Executive Council Member, or Senator, in the Cherokee Nation at the time of Dan Maples' killing. Ned went directly to the Chief and said he was going to go talk to Judge Parker to clear himself. Many people talked him out of it, knowing that Parker would never let him come, probably hang him on the spot. So, he went home to his wife, and family. He never left. 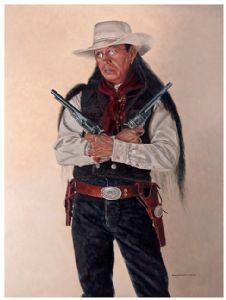 As a Cherokee Senator and a member of the Keetowah Society, he firmly stood his ground that the U.S. Government had no jurisdiction in the Cherokee Nation. At the time, they didn't. In fact, he actively and feverishly spoke out against the Curtis Act and the impending Dawes act on the floor of the Council. On one occasion, a posse which included Heck Thomas managed to sneak unnoticed to Christie's cabin. After the cabin caught fire, Ned's son bolted for the woods. The lawmen thinking it was Ned Christie wounded the boy. Finally, when Christie ran, Heck Thomas fired. The bullet fractured his nose and made his right eye sightless. From this point, Ned stayed at a place known as Christie's Mountain. It was a fortress of sorts with a thick walls made of stone and wood. Numerous attempts were made by posses to dislodge Christie from the fort. All had to retreat with wounded men. Finally one group of lawmen arrived with a cannon and some dynamite. They used the cannon to topple the walls, then using a moving wall built from an old wagon, they moved toward the fort under gunfire. Finally, they used the dynamite to blowup the building Christie occupied. Chiriste ran after the explosion, straight into an officer. Ned was shot dead. His stance against the government resulted in his death. He was a patriot who held up the laws of his Nation, and is honored by Cherokees. In the enrollment and allotment of the Cherokees which followed his death, most members of his family in Wauhillau were denied allotments and enrollment. Even though they were fullbloods, and their parents were forced to walk the Trail of Tears. Ned Christie is buried in the Christie Cemetery in a "town" called Wauhilla, OK."
This piece is traditional oils on Masonite. The size is 18" x 24" overall.